1/35 U.S. M1A2 Abrams 120mm Gun Main Battle Tank Discounts Apply ! 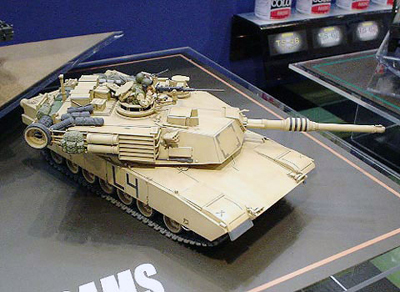 TAM35269 - U.S. M1A2 Abrams 120mm Gun Main Battle Tank. The M1 Abrams, the worlds' strongest tank, has undergone step-by-step modification since its commission by the US military in 1980. The M1A2 evolved from the M1A1HA, and features Intervehicular Information System (IVIS) and Commander's Independent Thermal Viewer (CITV). Kit features A2 turret comes with CITV and new style vision block. The M1 Abrams, officially commissioned by the US military in 1980, was designed totally different from previous post-WWII US military tanks. Although fitted with the same 105mm cannon as the M60, the M1 was powered by a gas turbine engine and was fitted with spaced armor. Planned to be commissioned by the US military over a long period, the M1 was designed with future reforms in mind. In 1984, the M1A1 was developed with a 120mm smooth bore cannon, and a further variant the M1A1HA was later developed featuring depleted uranium armor. This then led to the M1A2, which was fitted with Intervehicular Information System (IVIS), Commander's Independent Thermal Viewer (CITV) turret and new style vision block. The M1A1HA and the M1A2 both played significant roles in Operation Iraqi Freedom, being deployed by land forces as well as the Marine Corps as they moved toward Baghdad. Parts used to reproduce M1A1HA also included. Parts used to reproduce Marine Corps version included. Missile Counter Measures Device (MCD), smoke discharger and float brackets also included to allow reproduction of Marine Corps version. Combat Identification Panels (CIP), M2 machine gun, and Auxiliary Power Unit (APU) accessories included. Comes with Commander and loader half body figures. Decals for 4 desert vehicles and one NATO vehicle are provided.